All aboard! 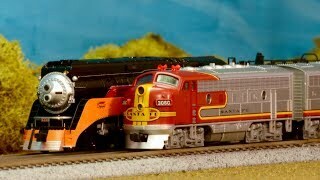 In this video, we will take a look at several different n scale model trains as they pass by a few different scenes. The trains are complemented by the sounds of real trains passing by. You’ll see steam trains, passenger trains, freight trains, and more! This is the first model train video I’ve done in a long time, and I’ve never done anything quite like this before. If you want to see more videos like this in the future, please let me know!